No one understands the hardships of employee turnover quite like a QSR franchisee. And it’s not only difficult to keep quality hourly employees on staff but managers, as well. Since you’ve already identified your managers as trustworthy, hard-working employees, it’s even more important to keep them around. How do you do that? By creating a fair and attractive bonus program. Bonus programs aren’t just about money. Offering financial incentives that are tied to the restaurant and employee performance give managers a stake in the success of the company. What looks like a simple bonus on paper can actually inspire pride and loyalty worth much more than the value of the bonus itself. Not sure how to get started? 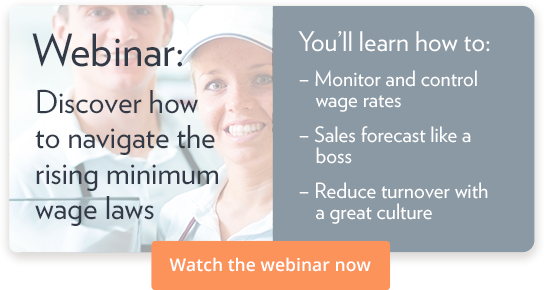 Here are four steps to create a QSR bonus program to motivate your managers. A good bonus program shouldn’t have any surprises. You already know the metrics your stores use to measure success — total sales, sales after costs, team performance, etc. — so use these metrics as a starting point for awarding bonuses. Create criteria for your bonus program that clearly explain how a manager can earn the reward. A manager who is awarded a bonus should know why they received that reward, and a manager who doesn’t receive one should know where they need to improve. Show managers how to personalize those criteria to create an action plan for their stores. If bonuses will be awarded to managers whose stores have a minimum of a 97% order accuracy rate, for example, a manager whose store has a 94% average order accuracy will know that they need to improve it by at least 3% to earn a bonus. After you’ve defined action items based on store metrics, you can get creative. Is there a new item on the menu? Award bonuses based on stores that sell a minimum number of those items. Is Wednesday typically the slowest sales day? Tie bonuses to improving Wednesday sales. Make the bonus program meet your business needs. Once you’ve laid out the metrics that will define the structure of your bonus program and detailed specific actions that managers need to take based on those metrics, all that’s left is deciding on the small details. Most programs award bonuses monthly, quarterly, or annually. Monthly bonuses have the advantage of allowing managers to quickly see the results of their efforts. Did they try something new that made a big difference in sales? Quarterly bonuses are great for finance-minded managers because they can align with financial quarters. Linking bonuses with the success of the business helps managers become invested in the growth of the restaurant and is one of the biggest advantages of a bonus program. Annual bonuses are popular because they reward year-over-year performance. It’s also easier to calculate and distribute bonuses once a year. You’ll also want to decide if you’re going to award partial bonuses to managers who meet some, but not all, of their goals. Partial bonuses are a great way to incentivize managers who are making progress toward their goals without discouraging them for falling short. Once your program is created, clearly tell your managers what it is and how it works. In order for a bonus program to be effective, managers need to be absolutely clear on what’s expected of them and the reward for meeting those expectations. The devil isn’t in the details here, it’s in the communication. Create a communication plan that uses multiple channels (no, one email isn’t enough), and give managers the opportunity to ask questions. Bonuses are a great way for managers to take a vested interest in the success of the company. Restaurants with bonus programs show managers that the success of their stores provides them with a direct financial benefit. Cultivate a team of high-performing managers with a QSR bonus program.